We were so sorry to hear that you had passed. Really. It was a shame and a real loss, we’re sure to you especially. But then someone went and started an annual party to remember you. Over the years the party has become filled with strange rituals embodying the warped fringes of human imagination. Like flinging frozen fish. Snow volleyball. Brain freeze contests. Costume-clad humans plunging themselves into freezing water. Coffin racing. Each act disturbing in its own right. But along with the weirdness come friendly faces. Handshaking and backslapping and people calling hellos across the street. Shopkeepers and townspeople opening their doors to strangers for a few days. Tents full of people and music. And in the midst of your physical absence something descends on the caricature crowd navigating muddy streets. Difficult to put a finger on, the longer one dwells within it the more palpable it becomes. It is THE VIBE. It is the mood and temperament that begins to permeate every event and location. THE VIBE is why we come here, and why we want to come back. THE VIBE is not possible when we are alone, battling our individual life challenges in the relentless pursuit of who knows what. THE VIBE only appears when we come together, with no real purpose other than to experience THE VIBE. Which, really, means to be in revelry with one another. And so, frozen dead guy, we thank you for the gift you have given us through your most unlucky demise. For you have bestowed a reason to gather, a means to build THE VIBE. The games, the music, the entire scene, is our tribute to you, and we salute you. 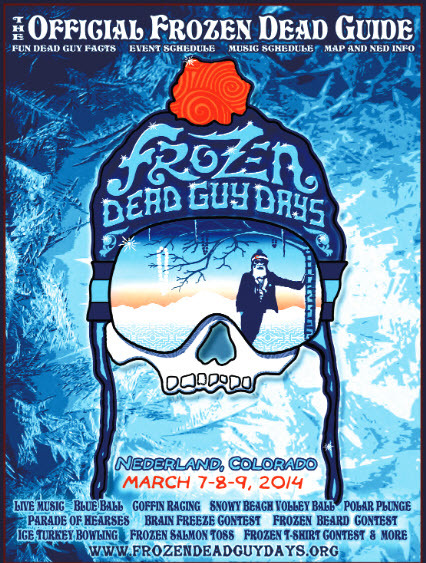 May THE VIBE we experienced today at Frozen Dead Guy Days in Nederland return, year after year, for it was deeply felt, and dearly enjoyed. Hell yeah!